One game that we love to play with Alyce is "Where's Alyce?". The game starts off with us pretending that we can't see her and we say "Where's Alyce?". She then picks up on the game and covers her eyes but peeks through spread open fingers. Alyce then takes her hands away from her eyes, we look at her, and say "There she is!". At that point she then covers her eyes again and we pretend look for her again. We look under the table, behind doors, and all over. Alyce is giggling and laughing the entire time. We have been playing this game a long time and she never seems to get bored of it; neither do mom and I. It is also a good way to get her out of a bad mood as this is always guaranteed to make her laugh. To continue this story Alyce did something rather cute last night. She has done it before, but now seems like a good time to write about it. Alyce climbed into a kitchen cabinet and closed the door. 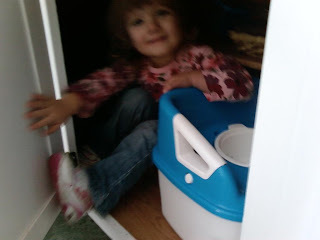 It was the cabinet where we keep our mixing bowls (her favorite cabinet). The cabinet has lots of room. While Mom and I were making dinner Alyce pushed some things out of the way, climbed in, and closed the door. At first we were wondering if she was ok in there and after a few checks on her she seemed to be ok and enjoying herself. She liked the spot so much she even went back after dinner. Who can fathom why kids do the things they do? 0 comments on "Where's Alyce?"